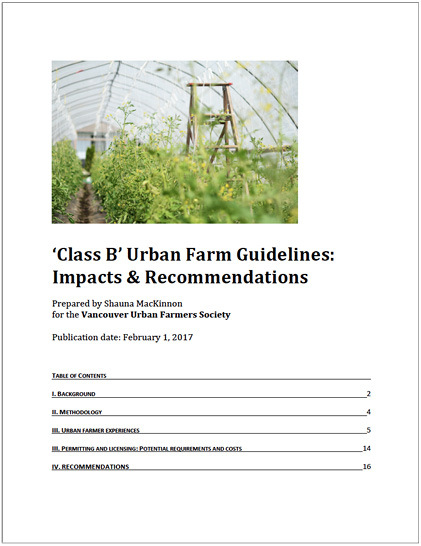 The primary objective of this report is to document the personal experience and perspectives of urban farmers categorized as Class B Urban Farms to more fully understand how the Urban Farm Guidelines affect them. 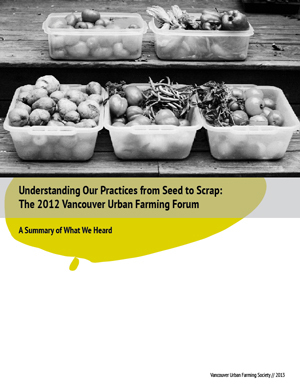 The report includes background on the 2-year Urban Farm Guidelines pilot in Vancouver, describes the challenges that farmers are facing around the costs of permitting and upgrades to meet building code bylaws, and lays out recommendations for consultation, incentives, city investment, and research to create a more enabling environment for urban farming. This document was written in a context that was continually shifting. At its inception, the Vancouver Food Strategy was still being crafted which since its adoption in January 2013 offers a clear directive to create urban farming policy for the City of Vancouver. We also witnessed some important additions to the ever growing repertoire of made-in-Vancouver and BC urban farming publications including the Urban Farming Guidebook, Land Access Guide, and the SOUL Organic Land Care Standards 6th Edition, which cover many of the same topics we set out to explore. And so, what makes this document unique? First, this work is not a guide on how to start or manage an urban farm. While we hope that it will be a huge asset to practicing and aspiring urban farmers, it will not tell you everything you need to know: there is no formula for how to be an urban farmer. This hunch of ours was affirmed after interviewing and surveying a total of 24 operations in Metro Vancouver listed earlier who are cultivating this urban region with approaches ranging from shipping container micro-green operations to backyard CSAs, parking lot farms, schoolyard market gardens, and a whole lot in between. Inherent in the movement’s complexity, diversity, and relative youth is a challenge in positing any singular practices as ‘best’. The first Urban Farming Forum, which took place in 2011, invited food security advocates, policy makers, and urban farmers alike to engage in vibrant discourse around urban farming, as well as discuss ways in which Vancouver’s Greenest City goals could be met in the context of urban farming policy. The 2012 installment, at the HiVE in Vancouver, was centered around urban farmers specifically to allow for a more concerted effort at data collection and discussion most relevant to the farmers themselves as part of a year long research project into urban farming practices in Metro Vancouver. 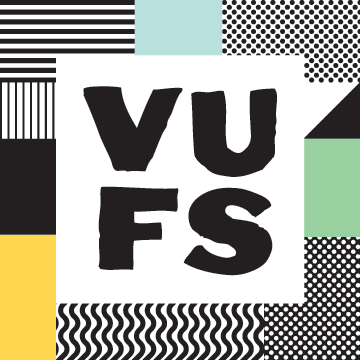 We had 18 urban farming organizations from across Metro Vancouver participate and work with us to create a baseline landscape of urban farming practices throughout the region with a focus on the City of Vancouver. It was the beginning of the much larger community research process that is underway which looks even closer into the landscape of practices addressing what is working, what is not, and where the gaps are. The Urban Farming Guidebook is a resource for local governments in BC that are planning for the business of growing food within their towns and cities. The guidebook has been produced by EcoDesign Resource Society and HB Lanarc Golder in collaboration with local governments and urban farmers in BC. 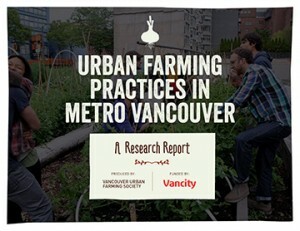 It features several urban farms in the Metro Vancouver/Lower Mainland region. Look out for familiar faces! The Strategy includes 84 mentions of urban farming and page 58 of the document focuses specifically on urban farming including 7 priority action areas. 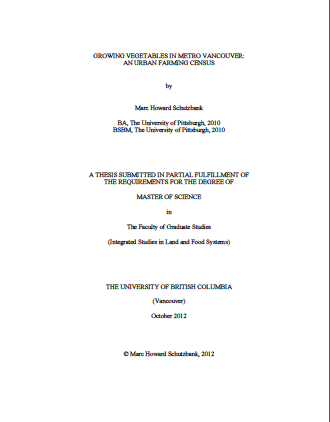 Abstract: This thesis is a qualitative case study of the mobilization and negotiation of urban farming, as an urban sustainable and economic resilient practice in the City of Vancouver…Considering the concurrent legal imposition of urban farming in this city, this case study analyzes how urban farming is advanced as a legitimate practice within different levels of the urban political terrain. 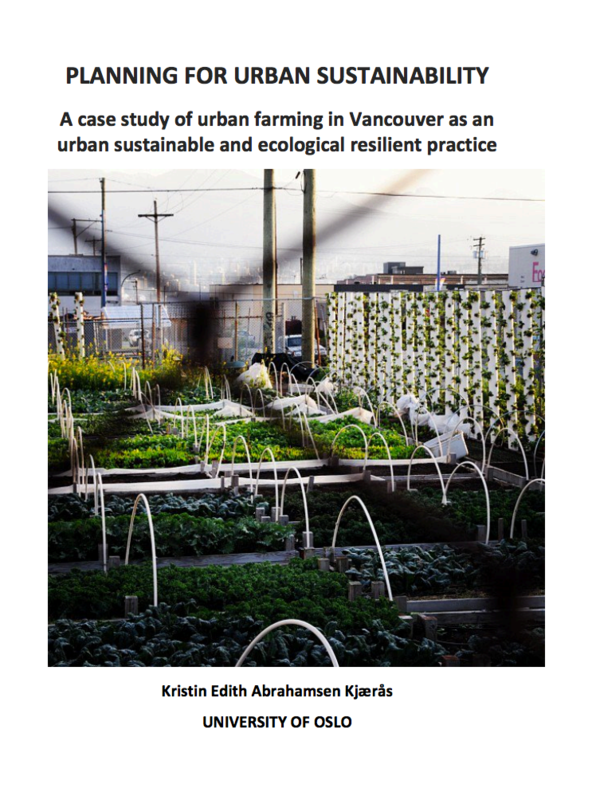 Further, this thesis progresses insight into the concrete dynamics hindering and contributing to the mobilization and negotiation of urban farming as a legitimate practice in the City of Vancouver. Schutzbank, Marc. 2012. Growing Vegetables in Metro Vancouver: an urban farming census. MSc.Thesis. University of British Columbia. Canada. The B.C. Land Access Guide provides a framework for new farmers looking to explore options for how to get on land. It is a guide for new entrants into sustainable agriculture to access land, with a focus on British Columbia, Canada. If you are an established farmer looking to negotiate a land access agreement, appendix B can support process. “New small farmers are key to building new farmers markets.” This manual, put together by Davis Farmers Market Association in California, seeks to provide an overview for new farmers, ranchers and food producers on engaging in direct marketing via farmers markets. 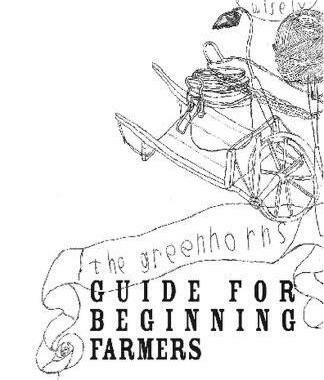 The Cornell Small Farms Program released a free guide to urban farming in New York State. The 105-page resource guide looks at common questions about urban farming and is geared toward helping new farmers to launch, continue, or expand their urban farm business. It includes tips and fact sheets on topics including: Engaging communities, Dealing with contaminated soils, Intensive growing techniques, Urban composting, Site security, Urban livestock and Direct marketing options.